I tried the Stick With It and Flock today. 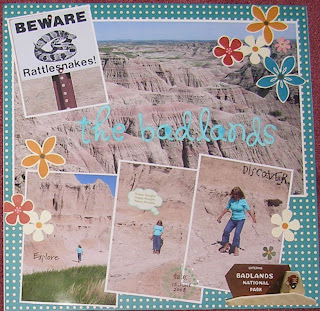 It's a page using photos taken in Badlands National Park, South Dakota, in June this year. The effect is a little 'bitty' and, next time, I'll make sure to press the stuff down harder and for longer! It was my birthday yesterday (I'll never say) and, apart from munching though about a pound of chocolates, I didn't do a lot. Nick and Nicola bought me a very nice little assortment of scrappy stuff to drool over! Also (and what I am most excited about!) are the sheet of Doodlebug Stick with It letters and the (swimming pool blue) crushed velvet flock to use on them! Can't wait to play with that! We went to (niece) Tracey and Rob's wedding a couple weeks ago. We stayed in Cardiff the night before and went out for a meal with Nick and Nicola. 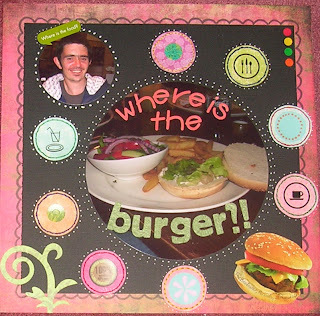 Paul's burger arrived with no meat - thus this page!! I've made a small album for Tracey, but the only photo I've scrapped for myself, so far, is this one. She looked so stunning. There's no way I can catch up completely and paste all my pages onto here! But I can post some of the more recent, including these I've done of our trip across the USA in June of this year (it's hard to remember what sunshine is like!) I cannot remember what paper etc I used on each page though. It's either new stuff, old stuff, stuff I got from ScrapYourTrip or stuff I bought in the (amazing!) 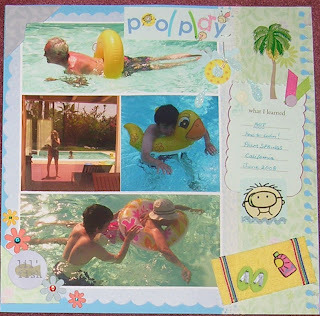 scrapbook store in Palm Desert. So, here goes, in no particular order. It was just wonderful, floating around in the pool at our Palm Springs house rental. Wish I were there now! 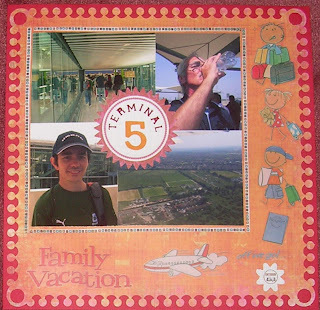 The lovely background paper is from Kay & Co.
Terminal 5 was nowhere near as bad as we'd feared and they didn't lose our bags! 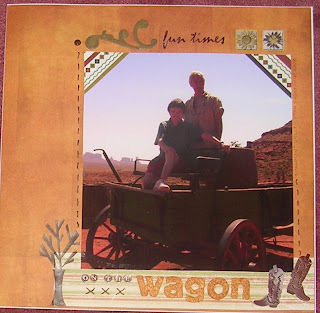 This photo was taken at Gouldings Lodge Museum, Monument Valley. I bought the boots from ScrapYourTrip! 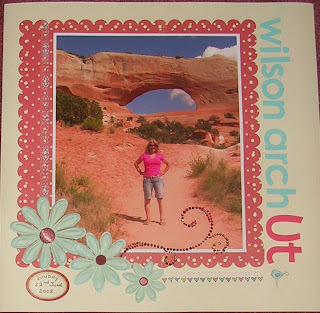 Oh, Wilson Arch, Utah - just outside of Arches National Park. Glorious! I'm pretty sure that the background red dotty scalloped paper was from Fancy Pants, but can't swear to it. Top Of The Rock, Rockefeller Center, NYC. This was one of those tourist snaps that you are obliged to sit for, before they'll let you into the lifts! 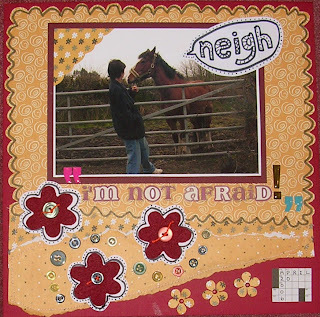 Certainly I used up a whole heap of scraps on this page! 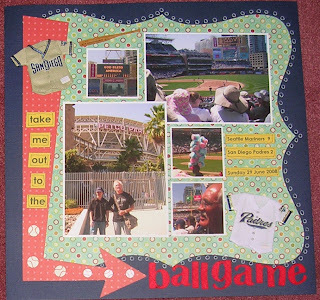 Yes, we went to the ball game in San Diego - an interesting experience! I bought the baseball stickers from the scrappy shop in Palm Desert - I didn't really want to use them, but felt obliged to. What a fabulously relaxing morning this was! 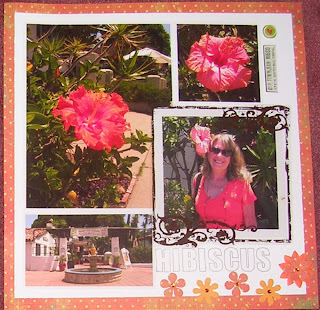 Beautiful hibiscus(es) at Old Town, San Diego. The acetate frame is from Hambly. 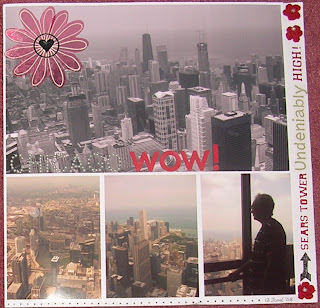 This was up the top of Sears Tower - wow, indeed! I bought 3 tickets online and I still have one of them, because Paul refused to go up; he also refused to go up the TOTR! The photos are lousy, because it was so dark. 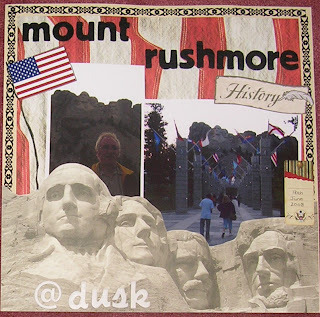 I bought the background paper as part of a National Parks Scrapbook Kit (somewhere). San Diego Zoo. 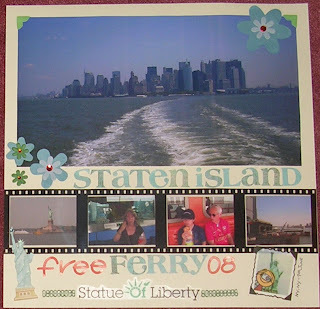 I decided to use several small photos on this layout - but I've printed them a little too small. Never mind, it's about as good a view as you get of the animals at that zoo (not the best). Fun at Wall Street Drug Store, South Dakota, astride a giant (mythical!) 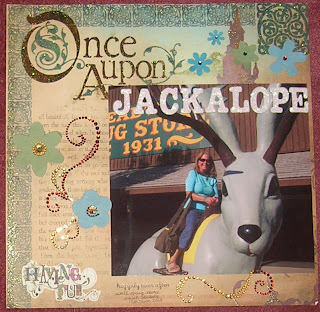 jackalope! 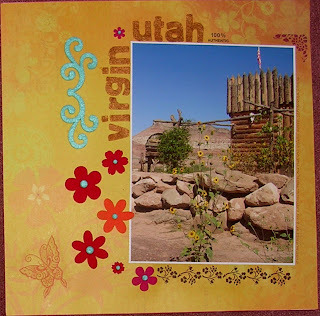 The gorgeous 'once upon a time' paper is from DCWV. This was on our way up to LA Airport, on our way home. A stunning place. That's all I've done for now - but I've got THOUSANDS of photos left to scrap! Long time no write .. I found a new plaything today. 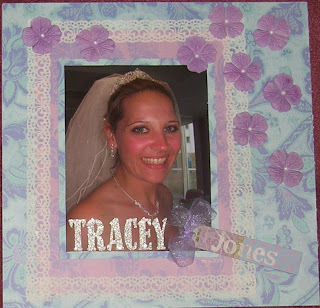 www.scrapblog.com and made a tinsy scrappy of Tracey's wedding! 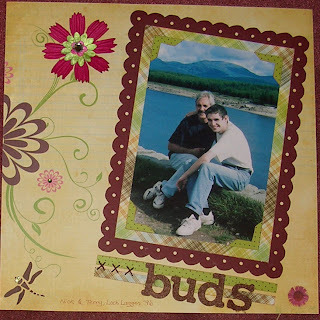 This page is of hub and Nick at Lake Laggan, Scotland in 1996. The background paper (Fancy Pants 'Crush') did most of the work and I just titivated that with some flowers and gems. 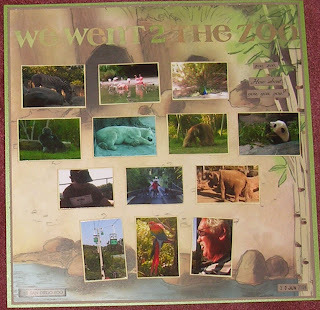 I hand cut the picture frame and punched all the holes (using Cropodile) - not very straight! The other papers (tartan and spotty) are A2Z It's Elementary, the letters are American Craft Thickers and the dragonfly rubon is from the recent Oriental kit from QVC (don't like oriental much, but the kit was a bargain and you can use it with most things). 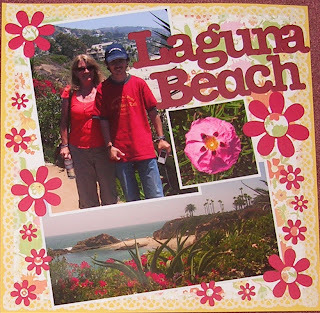 This page is of photos taken on our way to St Tropez in 2005, when we stopped at a deserted little cove. It was glorious - so much nicer than the crowded and commercialised town of St Trop itself. The feet are Paul's. 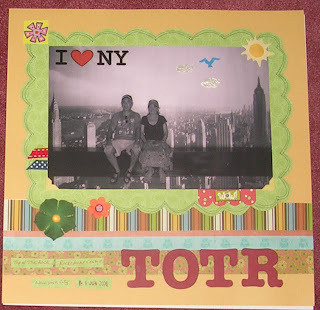 I struggled to find paper to match, but finally used Scenic Route's Loveland papers. 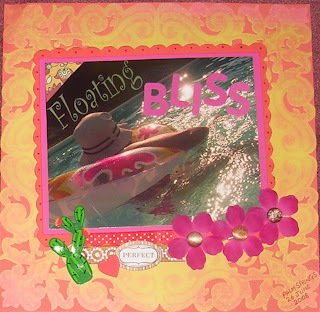 The letters are from American Crafts and Basic Grey - flowers are from my stash and the boat was bought from Bitz! The next three pages, I did this evening, all together - like a kind of assembly line! 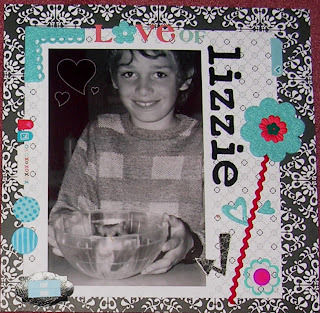 The first one is of Nick with his hamster, Lizzie! He loved the little thing, even although she kept us up at nights with the noise she made whirling around on her blasted wheel! She also gave you a nasty nip if you weren't careful. He cried when she died and held her in his hand for ages, hoping she was just hibernating! The paper is from American Crafts Elegant range; letters are American Crafts Thickers and Basic Grey; turquoise felt is from Fancy Pants and other bits and bobs are Elsie and ModPops (I think). The hearts in the photo are windings I typed in before printing. Next, I scrapped Andorra. I just printed out a load of photos, 36 cm square to go around the bigger one in the middle. I think I printed them out too small, but never mind! The paper is Autumn Leaves French Twist and the letters are American Crafts. I hand cut the swirl, after tracing around a Maya Road chipboard swirl - and the foam ladybird is American Crafts FieldHouse. It's all a bit pink really. Finally, I scrapped one of my favourite photos. It was taken at a store, just outside of Zion National Park, on the road to Las Vegas, in 2004. (I bought a string of china chilli peppers in the shop!). I wanted to keep it quite simple, so that the picture did all the work. The paper is K&Co Mira, rubons from the Oriental QVC TSV and October Afternoon + velvet flowers from Maya Road and Fancy Pants felt.